We are putting my mother's home on the market It would be the last large undeveloped piece of deep waterfront land on Port Hacking. It has been held by my family for over a hundred years. Here is its story. When, my grandfather, Walter James was a young man in the 1890s he would travel down to Port Hacking from his home in Fivedock, in Sydney's inner West. He would take the train to Sutherland then the horse bus to Yowie Bay where he would hire a boat to get over to Deer Park to camp. By 1909 he was a successful builder/developer and he took out a lease on some land in Great Turriell Bay. Later his sister Clara Jepson leased the land next door. At first he built a single room boatshed/cottage but after his three children were born he extended this, now named “The Rocks” and built a separate boatshed. 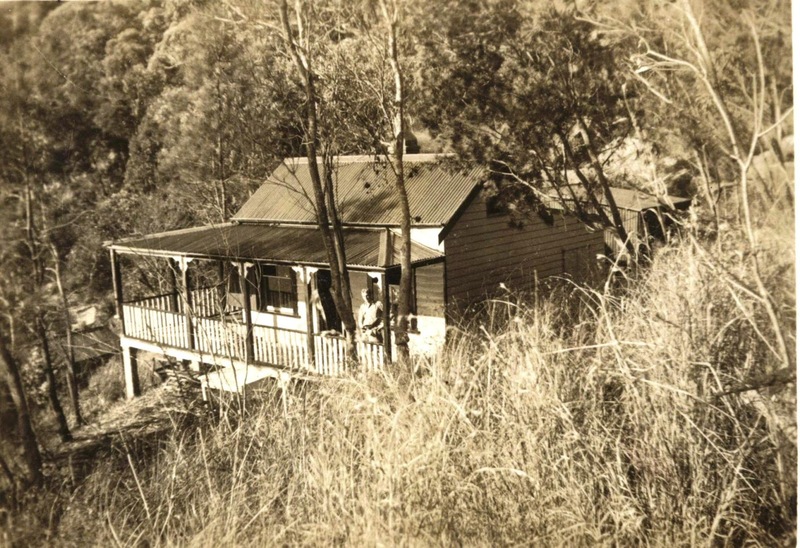 By 1920 he had built a house for his sister next door, “Mirrel”, and another boatshed. 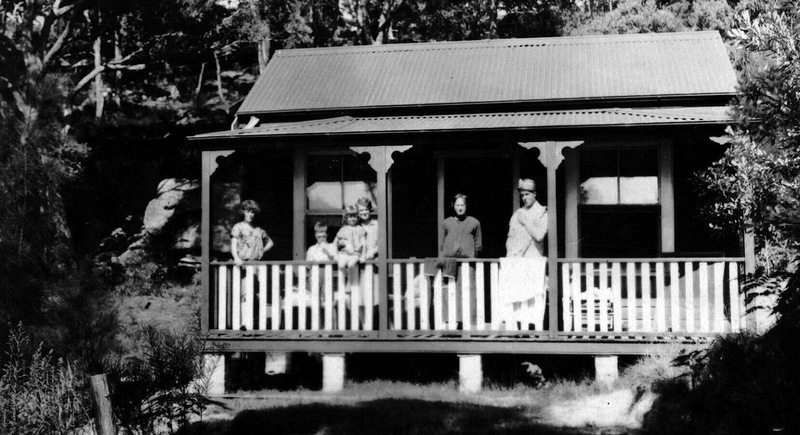 Clara’s house "Mirrel" in about 1925 with, from right to left Walter leaning against the post, Clara, Walter’s wife Agnes and their three children Peggy, Tom and Molly. The houses became a base for boating and fishing and sailing and swimming. More members of the extended James family joined in and extra rooms were added. You can still see the shape of this in the existing house. The cousins grew up holidaying together and by the late 1930s they were bringing their friends down to stay. They were studying at Sydney University and had a lot of takers who wanted to join in whenever they headed down to “the Port”. There’s still a mark from the keg on the old table, they had good parties, well away from any supervision from parents. 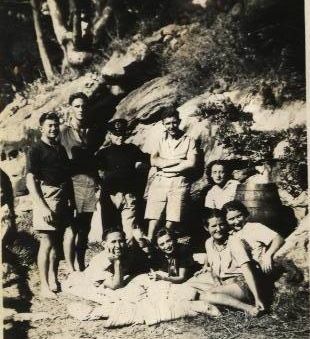 All these happy young people were shortly swept up by the war. Peggy married Angus, one of the young men who’d been visiting “the Port”, who according to family legend, was as much in love with the place as the person. During the war, while Angus was in New Guinea, and with a severe housing shortage in Sydney, Peggy moved down to live there with her two babies. She chose to occupy Mirrel because it was bigger and had a fuel stove and by now a veranda had been added that went right around. Because of petrol rationing problems, she would row the boat up to the store in Lilli Pilli to get supplies with the baby tied to the back seat of the rowboat. 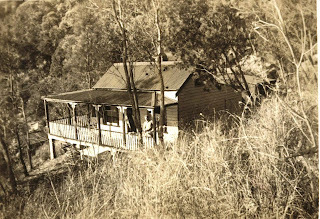 Mirrel circa 1945, you can glimpse the boatshed below, and Keith Jepson on the veranda. After the war, Angus and Peggy settled in South Cronulla, next door to her parents in Richmount Street, gradually increasing the family until they had seven children. Cronulla was booming as a holiday destination, it had the train directly almost to the beach and people would come from all over Sydney. Every summer was spent at the Port, renting out their house to holidaymakers to help with their finances, and because they loved it. In 1951 Walter was able to purchase all the leasehold, he put it directly into the names of Peggy and Molly, their brother Tom had gone missing in the Bahamas during a training flight out of Canada during the war. After Walter’s death in 1955 Angus and Peggy moved down with all seven children, to live in “Mirrel”. 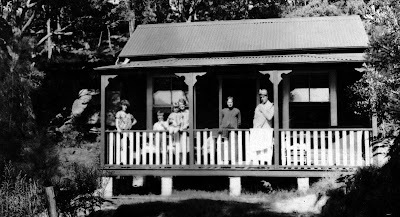 Angus converted the open verandas to glassed in rooms, using scrap metal windows from a factory construction in Pyrmont. He put in a septic tank, up until then the “night soil” had been collected by boat. 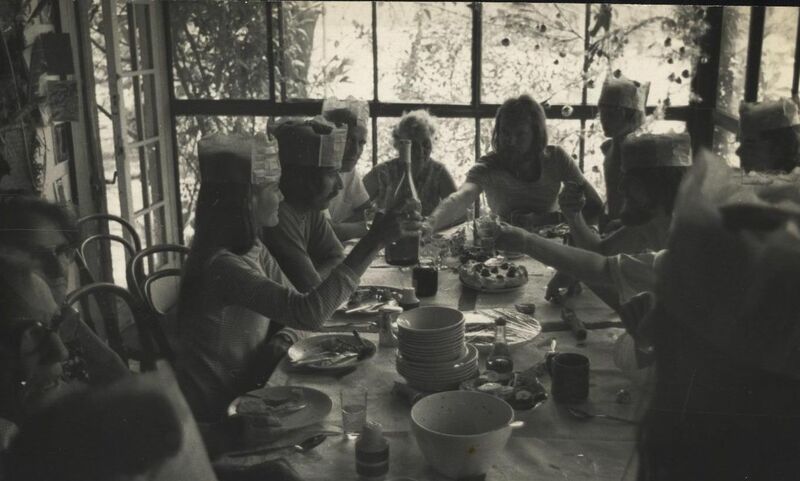 Xmas 1972 showing the glass windows and a full family gathering. Peggy and Angus made the most of living in paradise. They moored their ketch “Seawind” below the window, and would sail it up to the Whitsundays each year. Angus would pop over to Wanda most mornings before breakfast to join his mates for a bodysurf. Peggy loved the bush, applying the methods of bush regeneration. She also loved the water and the creatures of the sea, collecting prawns and other sea life to keep in an aquarium. Late afternoon sun lighting up the boatshed. Late afternoons are delicious, sitting about on the outside veranda as the sun disappears over the Royal National Park. When there is no wind the water becomes smooth as glass and there’s always time to enjoy a cold beer in the rosy afterglow, the water reflecting the pink of the sky. The stone jetty where the groper used to live looking across to the Royal National Park. After Angus died in 1989, Peggy lost ground in looking after so much bushland and by her death twenty years later it had became a weed infested jungle. Some of this has now been cleared and if you take the opportunity to visit during the coming open houses you’ll be rewarded with a small taste of the local paradise there for the taking. Postscript: It's sold, the boatshed half has gone to my brother, the house to a lucky boating family. 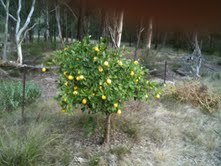 I harvested the lemons today. 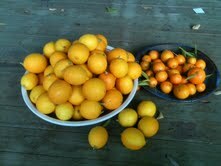 There were a few mandarins that I picked too. They're all small because they were starved of water for so long. I'll give them to Vivien to be made into lemon butter. The mandarins, maybe some marmalade. I was filling in the form for the capertee valley alliance membership and it requested a web site (if I had one) whoops - haven't been keeping up. But I gave this one anyway, but it reminded me about my movie on Youtube http://www.youtube.com/watch?v=mXe8X9n1woQ. I digitised this film that I made back in my women's movement days and loaded it up last year. Capertee Valley Alliance "temporary blogspot" is a mine of information about the valley of which Glen Davis is a corner. Donna and Bruce are working on a comprehensive website for the valley but meanwhile have created this wonderful and always up to date centre of information. I am a water person, I grew up next to and in the ocean. When I see water I want to immerse myself. I live where I can see the sun come up over the ocean, I can walk to beaches in two directions. I can paddle my kayak any day I choose on the harbour nearby. So howcome I just committed myself to buying 100 acres (40 hectares) of bush and farmland 3-4 hours drive from the ocean? I thought it was all for G, my partner, who needs space and lots of it to spread himself out and muck about with sculpture and other activities. We had the money because the long running saga of Aunty Molly's legacy is nearly finished. I wanted to get all his stuff out of our place, I wanted to lose the tension of constantly having to ask him to move the latest pile out of my way. But when I stood on THIS piece of land, everything changed. We settle in 4 days and take possession. I'm very busy getting it all together so I'll just post a few pictures. This is the view looking up into the land from the entrance, you can just see one of the buildings in the trees. The cliffs at the back are part of the Wollemi National Park. This is the view the other way and what we will see from our front verandah. There are fruit trees - apples, pears, peaches, lemons, oranges + They'll all need attention because no one has cared for the land for two years. In the shed there's a tractor and lots of other gear but we'll be finding out exactly what as time goes on. And there are two sheds, both full of stuff, the stuff is also in piles around the place. We made an offer 30 minutes after we got there. We didn't even have to discuss it. Then later we started to find out more things about the valley and everything just kept getting better. It backs onto a most fabulous set of rocks with spectacular and almost unused canyons -http://www.david-noble.net/canyoning/Essay/GlenDavis.html described by David Noble. A book has just been published about the shale mining - here's an ABC interview http://blogs.abc.net.au/nsw/2010/09/history-of-glen-davis.html?site=centralwest&program=central_west_mornings with the author Leonie Knappman. The area was opened up for shale mining in the late 1930's and the ruins are still there http://web.aanet.com.au/bayling/glendavis.html and there are great photos http://www.redbubble.com/people/salieri1627/art/2452214-3-man-o-war-glen-davis-shale-mining-ruins-the-hdr-experience . We're going to be so busy exploring that it'll be hard to fit in a little grass cutting and fruit tree pruning. This is going to be a bit of a test to see what I can do with this so don't expect any words of wisdom. I'm finding too much time available at my desk. Here's the picture that I've been using for my desktop ever since my Myall Lakes kayaking trip. It's been a great year for kayaking, until I took on a 6 week contract that stopped me going out on Fridays. Quite a few firsts - the first time to see the Harbour Bridge from my kayak, the first time out from a beach, my first three day kayak camping, my first time paddling nearly 30km two days in a row. I was looking for a role model for the me that was myself in an earlier existence and I was hooked by Mary Gardiner’s blurb at the LinuxChix miniconf 2009 where she was giving a talk about free software and mentioned command lines and coding in her spare time and something about her turn of phrase appealed. I had the feeling that she cared about things technical. So I set up a meeting to find out more. Here's her bit about herself. Over coffees we talked about how an old computer with DOS2 and BASIC came into her life when she was only 8 years old and with help from a book from the library she learnt how to program, but with the perennial problem of not really having anything that she particularly wanted to make the machine do it was forgotten. Until high school, that is, where she was reintroduced to programming and Visual Basic in year 9 when she completed the HSC computing course early. It wasn’t a straight trajectory even after that but in spite of a diversion through Chemistry she was running her own server by the time she was 19, with her own domain name – still in use http://puzzling.org/ , and a bloglike journal continuous since then. By 2000 Mary had discovered Linux and LinuxChix. For a couple of years co chairing the LinuxChix miniconf. Her areas are Python, Java, Perl, and C and now her PhD is taking up most of her creative efforts. Mary’s journal intersperses tech talk with life thoughts with suggestions that people donate blood for the bushfires. But overall a pretty solid amount of tech. What I really like was her blog On Girl Stuff about her talk on Free Software and who came and the way women seem to land in the low status roles and how that happens and what our obligations to other women are in all this. And outreach programs for girls. Mary was putting out there that tension I feel between saying Yes girls can do that stuff (code climb mountains etc) but lots of girls are better at other things (communicating weaving etc) what do we do? Push girls into boy places? Make sure that girl places are respected and paid properly? No easy answers for me after a lonely lifetime of being a geekish girl with no geekish girlfriends, would I do it all again? Well I think the answer to that is I’d have to, I did what I was good at and that was coding but my life gradually tipped over into other roles because I was good at communicating too. Whoops this is about Mary. I asked Mary about whether she has some female friends who she would go to for technical advice and it turns out that Mary is rich in female friendships that include computing. She has actively sought them out, LinuxChix is one of the places for this. She said it takes a while to develop from being there from being interested in the same things. Not really different from other interests. So that’s a big shift from my day and how wonderful. Maybe what’s changed is that there are enough women around now to be able to find the ones that you want to be friends with. Mary and her friend Alice started a group that meets monthly and discusses computer science papers that focus on a different topic each time. Sort of a techie’s book club. 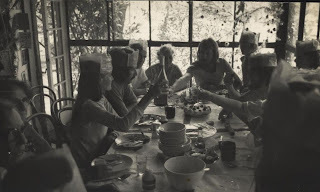 There’s blokes as well in the group, but Mary’s friendship with Alice was going to become the focus of this blog. I just haven’t managed to meet Alice yet. The other things about Mary – Mary likes scuba diving (big time), snowboarding, swimming, yoga. She’s been with the same partner for nearly 10 years. To be completed and pictures added when Mary gives permission. The following is an interview I completed for the Social Media site, EMC|ONE, at EMC where I work. Here's me today via my webcam. I'm not so young any more - in fact I was 60 this year! I've se en a lot of changes both in computing and in our community. I grew up in Sydney, Australia and still live here (who wouldn't, given the opportunity!!) I can walk to the beach where I swim or surf. I can see the sun come up over the Pacific from my home. And I do just that most days because I usually start work by 6.30am to be able to cross over time zones with my colleagues. As much as I love the asynchronous and sharing milieu of the web it can take ages when you're waiting on responses, so I like as much realtime interactions as I can get. I'm a plain spoken sort of person, not so good at subtleties. Often the straight man when someone is cracking a joke. This makes me pretty good at technical writing because I need to get everything down to simple statements before I can understand it myself. A bit more: Water, boats, swimming, surfing, kayaking. Bush, wilderness, walking, camping. Anti war activist, feminist, photography, filmmaking, publishing. Married, three children (home birth). Vegetables, gardens. Q. Tell us a bit about your professional world... Where were you before joining EMC? Then I decided (if you ever have some good wine and a long evening I'll tell you about it) it was time to slow down a little so I moved into Technical Writing. That let me stay up close to interesting technology but no longer right in the middle of it. The last place I worked at was Visionbytes http://visionbytes.com/ where I had an opportunity to work with an amazing bunch of very young, enthusiastic and very clever guys and I wrote the complete documentation for a pioneering media system which exposed me to modern storage technologies along with more XML and java applications. Q. When did you join EMC and could you tell us a little bit about your current areas of focus? I joined EMC in 2005 as a technical writer in Knowledge Centered Support, Global Services. In 2006 our team was given the responsibility for extending the existing Documentum and Legato Support forums to include all the classic EMC products. I was lucky enough to be given the task and started working with Erich Zirnhelt who had been looking after them since 2005.
involved and working out how to handle all the things that came up. We didn't have many resources, we learnt to recognise what was possible and to do the best with the resources we had. We have developed a lovely community in the forums. I am very aware of the differences between the enthusiastic volunteers and the reluctant conscripts. Somehow with the volunteers I barely need to show them what's there and they'll take off and do more than I even imagined with the tools. But when it's someone who's been told that this is now their responsibility I struggle to get the message across. I have experimented with different forms of training but essentially we still depend on the volunteers for all that's best in our community. see for EMC to leverage and better connect with our audiences? I’m already seeing what can happen. Many of our customers are isolated as the only expert in storage technology in their workplace. Our forums have been providing them with a place where they can meet up with other experts both EMC people and other customers. I can see that there are friendships growing up from interactions within our forums, there is an enormous amount of warmth for colleagues expressed in our coffee break forum. I have watched sometimes abrupt and critical new participants become cheerful members of the community, contributing more than they ever received. We had some photos posted to show the meeting of two forum users who had only met before in the EMC forums! I was part of the Apple Macintosh user community for many years, that was before the advent of Social Web and they put huge efforts into fostering the kind of loyalty that I am seeing emerge from our forums, with remarkably little effort from us. activities? Any examples you can share? Nowadays the forums/social media is everything I do so it's a bit hard to spot the difference. But in terms of EMC|ONE I've been very happy. All my efforts to make use of our own forums to share information about the forums and how to use them failed, the more rich interface of EMC|ONE has been much more successful and the ability to have wiki documents is terrific. I've been able to share the documents as I create them, and can keep them up to date without having to go through an official publication process. This has been so important because we've been inventing as we go and may need to make changes often to the processes that we create. The other benefit was that by using EMC|ONE to share our experiences they were getting a wider audience. And above all – we stopped feeling so isolated with all the issues that the customer facing forums bring! As a remote worker, who's closest work colleague (Erich) is in the wilds of Canada; the fact that Erich keeps a personal blog up to date has enabled me to have the kinds of social exchanges with him that you take for granted in a shared office space. In fact this has become the best bit for me of EMC|ONE - the generous sharing that people like Gina Minks have done with their personal web spaces and interests. Dale Hoopingarner turned out to have so much more to know about than I had discovered in my brief meetings with him. In my personal life, as the mother of a traveling anarcho-vegan son who chooses not to initiate any direct communications but did allow me into his Myspace site I have benefited on a daily basis. I could see that he was still OK, and I could almost keep track of what cities he was in and what events he was attending. and a bit about his friends too. peers in general, what would it be? Wow just ONE bit of advice?? Right now we have a lively and active community on EMC|ONE but its made up of all early adopters, the small proportion of people who jump in and give new things a go. If we want the EMC|ONE community to include everyone at EMC then we'll have find a pathway for the majority to get involved. From amongst all the unsung heroines: entrepreneurs, innovators, sysadmins, programmers, designers, games developers, hardware experts, tech journalists, tech consultants . . .
Who do I want to write about? Someone who's already made their mark? Somebody that represents what I feel/think about technology? I've been a woman in technology all my adult life. Sometimes I've been the only woman present in a bunch of geeks. Sometimes I've been the only geek present in a bunch of women. So I jumped at the chance of helping to document the existence of women in technology when Suw put out the pledge for Ada Lovelace Day. I thought it would be easy - just select one of the great women that I have studied or worked with over my time in computing. I wanted her to be an Australian. So I started to contemplate who I could write about. My first thought was Jenny Edwards, one of the 4 women in third year maths at Sydney Uni in 1967. It was Jenny who introduced me to Computing as a reality and not something in science fiction because she was already studying it. Jenny went on to have a distinguished academic career with plenty of notable involvement in the industry but I was looking for something else. 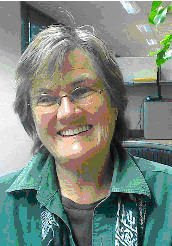 Then I thought of Judy Kay, now a Professor of Computer Science at the School of Information Technologies (formerly Basser Department of Computer Science) at the University of Sydney. Who was helpful to me when I returned to study there briefly in the 80s and who has specialised in the edge between people and machines. But I wasn't going to be able to do much better than her own description of herself. By now I knew that I was looking for je ne sais quoi so I stepped sideways and looked for famous Australian women in IT. This led to Kate Behan who helped establish the Australian Computer Society as what it is topay. Then to Lindsay Cattermole who made a great commercial success with Aspect Computing and followed this with extensive roles in the business of IT in Australia. But something was missing. I wanted to feel the geekness I wanted to write about someone that I wish I had had as my friend. I found myself sifting my Google searches and landed on a Linux page and there I discovered a nice nest of geeky women. I’d forgotten about my time with the Sydney LinuxChix - this was where I might find the person I was looking for. I loved it, here was someone who codes in her spare time! And what’s more she is completing her PhD at the Uni right next door to my office so I could meet and talk. Woohoo . . . off I went and you can read about our meeting in my next blog! Our place is for sale here.